Maude and Parker are in love, and this garden reflects their romance with its sweeping colors and design elements that are both personal and casual. A romantic bench serves as a focal point in this picnic scene, with Maude’s parasol sitting nearby. Furniture captures another time and place with a classic, if aging, motel chair and a vintage deck chair. Flowers fabricated from recycled glass bloom among roses, rhododendron and tulips. Atop stone and grass steps, a gate extends from a stylized metal tree and draws attention to the garden’s center–water in a picturesque container splashing into a rill and flowing to a pond. This fragrant garden uses a variety of plant material to set the mood with vibrant splashes of lush green and white, with blooming and leafy plants providing accents of pink, cream and silver. 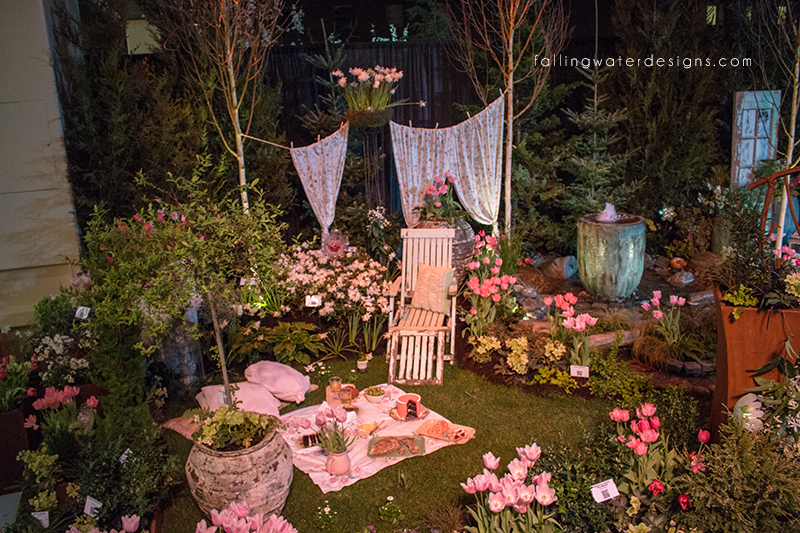 “Take-home ideas” for your own garden: Inventive use of color and textures to create a mood. 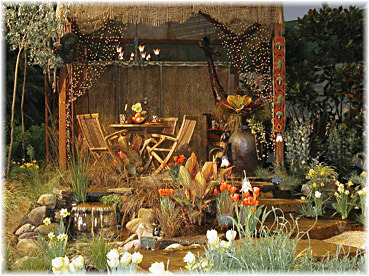 Our garden in the 2008 Northwest Flower and Garden Show was themed, ‘Dreams Really Can Come True’. Our installation was well received, winning both a gold medal as well as the American Horticulture Society Environmental Stewardship Award! I dream of walking through the woods and coming upon a sun dappled glade in which the remains of an ancient garden reside. Within the garden are a large pond, a sunken fire pit, and a gathering space. Rain falls softly. I start a fire to warm myself, imaging what ancient people might have enjoyed this magical place. As I awake from my slumber rested and recharged I realize dreams really can come true. In 2007 we were given the much coveted ‘People’s Choice Award’ in addition to a Silver Medal. 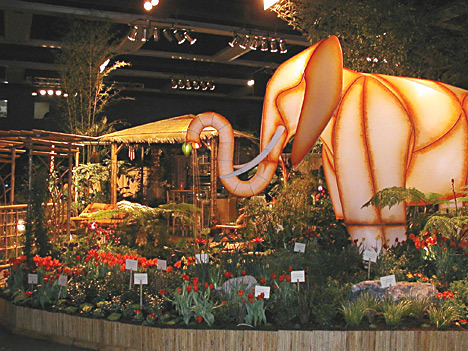 Yabba Dabba Do was a modern interpretation of a prehistoric garden. This was perhaps the garden of your great, great, great… great grand parents! Our garden replicated what we imagine an outdoor living space might have been like in prehistoric times. 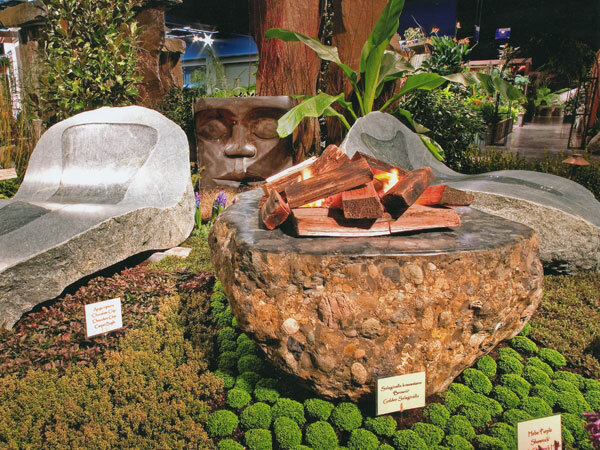 Stone furniture, a fire pit, and a large water feature surround you in this small garden space. Step back in time and connect with your primal self. 2006 we decided to take the year off. This 2005 garden is about kinetic energy and motion. Various forms of energy such as fire, water, and wind are reflected in the space. Flames flicker in a fire cauldron. A large pond allows water and light to dance over the surface, and jewel like fish to swim past. Imagine pieces of art, and plant material moving in the slightest of breezes. Industrial materials give the garden a bit of a modern edge. Sit on a patio shaded by sails, relax and become the calm stillness in your garden space. 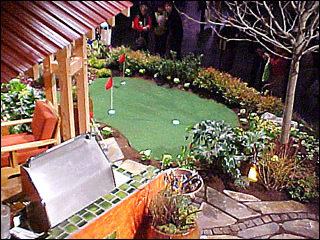 In 2004 we were awarded a Gold Medal at the Northwest Flower & Garden Show for Finding Your Inner Child: A Playground for Adults. Remember when you were a child and the garden was your playground? When hide-and-seek and ring-around-the-rosy brought you out into the garden? Full of childhood pleasures re-imagined for adults, this grownup play space includes an outdoor chess set, a putting green, a spa and shower, an outdoor structure with comfortable furniture and a built-in BBQ. A tree house above it all offers a bit of adventure, a vista over the garden and another retreat from the stress of the day. Invite your friends over, but remember…play nice! In 2003 we were awarded a Gold Medal at the Northwest Flower & Garden Show for My Thai: A Tropical Delight. Bright colors of fuchsia, purple, lime and tangerine, and bold foliage impart the feeling of a tropical garden paradise. Exotic bananas, bamboo and hardy palms combine with other intoxicating plant material chosen to thrive in a Pacific Northwest garden. Stroll past a ten-foot-high glowing elephant, lotus flowers and over stepping stones crossing the lagoon to your very own, secluded outdoor bungalow and kitchen. It’s a jungle out there! A rusted-metal lion and antelope graze in a field of ornamental grasses and other drought-tolerant, low-water-use plants suitable for a Pacific Northwest garden. A stream flows gently through the scene. Accents of warm-colored stone – red, buff, gold, sienna, dark brown – are reminiscent of the savannah. A cozy patio, fire pit and rustic arbor complete this Northwest Safari. Come and explore your own backyard. 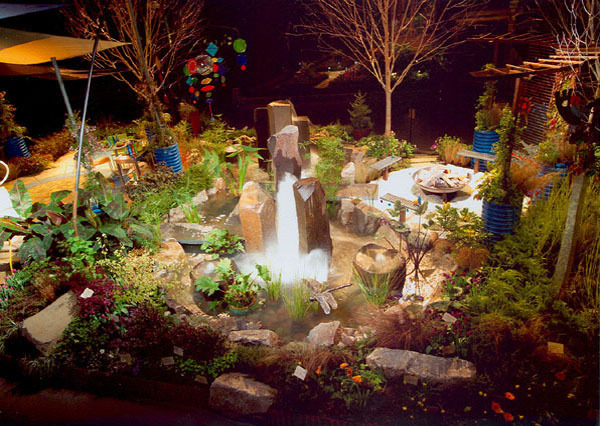 In 2001 Falling Water Designs participated in the cooperative group that designed the Wedding Night Garden at the Northwest Flower and Garden Show. 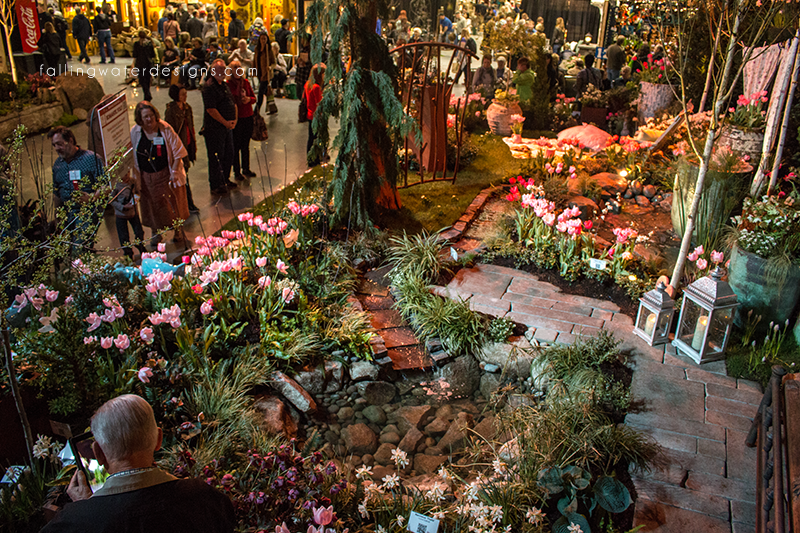 The Wedding Night Garden was awarded both a gold medal and The People’s Choice Award. 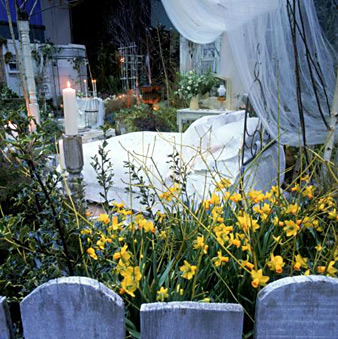 A small, secluded garden is transformed into a Wedding Night Garden. An outdoor shower nestles among mysterious purple flower and foliage…a path becomes an intimate dining room…a draped arbor becomes a bedroom. Water falling from an aged urn suggests timelessness. The quiet of burnished brown grasses surrounding ethereal birches surrenders to the potency of orange and yellow flowers. The romance of the garden enhances the romance of the night.